Brighid, daughter of the Dagda, Goddess of Poets, Healers, Smiths, is a well-known and loved patron saint of Ireland. daughter of the Dagda, the great god of Irish mythology, the ancient protector of the tribe Imbolc. She is also a revered Christian saint and pagan goddess of healing, poetry, smith-craft and midwifery. Her feast festival on Feb 1st (St. Brighid's Feast - Candlemass), celebrates the beginning of Spring. It is traditional on the eve of Imbolc to weave a Brighid's Cross, a whirligig pattern, from pulled rushes or straw. They are hung in the rafters, and by the door to protect the house. Within the Celtic tradition, birds are soul carriers between the worlds, connecting the realms of earth and sky. 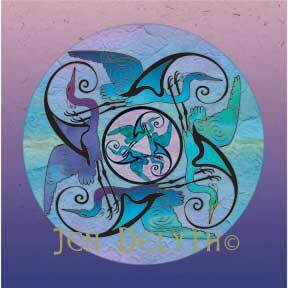 In this design, four white Cranes form the Brighid's Cross - the White Crane is particularly associated with the spirit of the trees.